Durban - The women dominated the second day of the SA National Aquatic Championships taking place at the Kings Park Aquatics Centre in Durban on Tuesday. 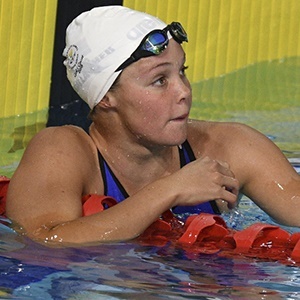 In the 50m butterfly, Erin Gallagher was in record breaking form winning the race with a new South African record time of 26.30, shedding 0.06 off Lize-Marie Retief’s 2008 time of 26.36. Rebecca Meder just missed out on adding her name to the FINA World Championships Qualification list when she won the 200m freestyle in 2:00.82, 2.16 off the required 1:58.66. The silver medal was claimed by Dune Coetzee in 2:01.09 and the bronze by Marlies Ross in 2:04.44. Christopher Reid (23) started the competition on a high note with a FINA Qualification time of 1:57.11 in the 200m backstroke, followed by Martin Binedell in 1:59.13 and Alessio Ferreri in 2:04.46, while the 200m breaststroke saw Alaric Basson take the top honours in 2:13.42 ahead of Ayrton Sweeney in 2:15.32 and Bailey Musgrave in 2:16.84. The SA National Aquatic Championships will continue on Wednesday with the heats session starting at 09:30, while the finals will begin at 17:00 daily.